He eats up the questions and farts out the answers...he's FARTOSAURAS REX! I'm doing this on my next math test. I'm on your math paper. Eatin' your problems! Wait, I think that he got it right! RAWRZ! IMA GONNA TO EAT YOU MATH PROBLEM! This is what really killed the dinosaurs. "Methane"
Lol, he got a 5/2, that's epic! 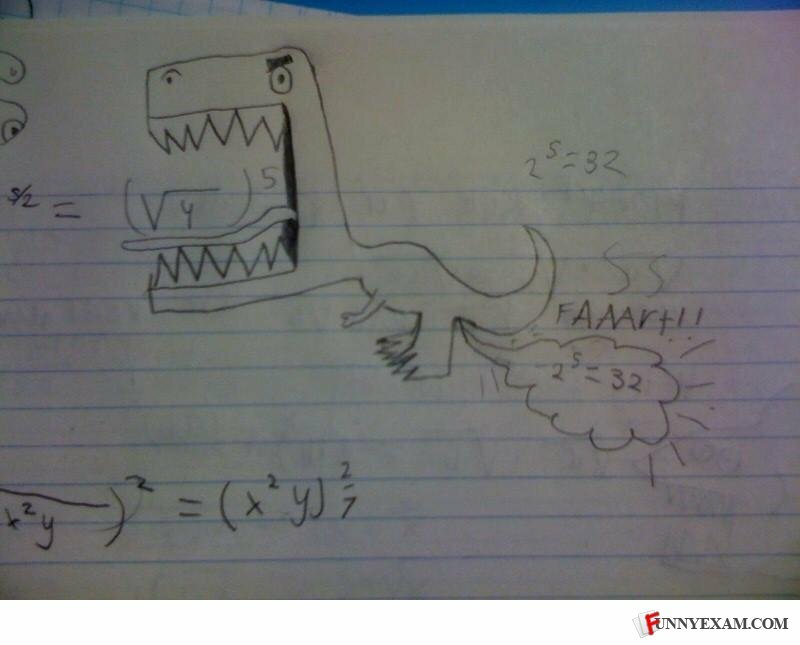 Fartosaurus rex is the new calculator! i dunno why.. but when i saw this is said "DOKTOR OKTAGONAPUS BREEEAHH!!!!" This actually made me chuckle in such a way that I farted. I'm actually being serious. Just once, not more, not less. Where's Micheal McDonald doing back-up vocals for the fart? Joe Paterno walks into a bar...he should've walked into a police station and filed a report.